I think I successfully crossed a Yuzu with a green finger lime. Last spring I removed the petals and anthers from a flower on my Yuzu, and collected pollen on a paint brush from a green finger lime, and got a fruit. In Nov I planted the seeds. 11 have sprouted. 8 have two sprouts and 3 are singles. all of the 8 look just like a Yuzu developing the double leaves of a Yuzu within three or four leaves growing. Of the 3 singles one is very different. 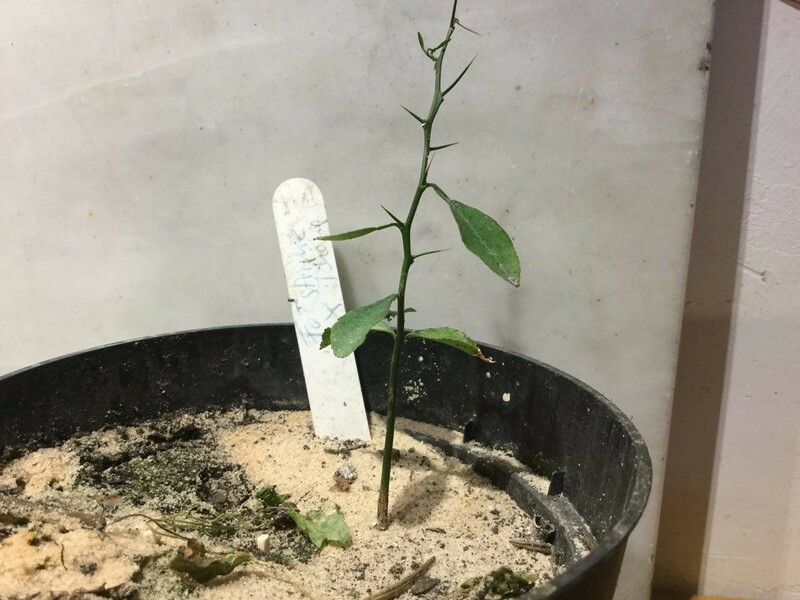 It's leaves are longer and skinnier than a Yuzu or a finger lime, it has two leaves but the inner one is very very small compared to a Yuzu, and the pattern of the thorns are like a finger lime, not a Yuzu. Also is sprounted about three weeks later than the others, and is slower growing. Here are some pics, also this is under a grow light so the color is crazy, they are all very healthy and green. From what I can gather from reading from all of you, Yuzu are about 15% Zygotic right? and Finger limes cross fairly easily, or better than many other citrus? Most Australian citrus hybrids have very small leaves. Those leaves look like regular yuzu leaves. Just a heads up. I have several Yuzu seedlings right now. The 2nd picture looks different from mine. First leaves are different more like a Finger Lime seedling. Upper parts looks more Yuzu like. most juvenile citrus leaves look like that. ALL of my hybrid citrus retain the small leaves. Faustrime, Bloodlime & Sunrise lime all have similar small leaves. I have never seen a Aussie hybrid with the extra wing like these have. Yuzu does not always come true from seeds & you will get variance in the seedlings. I never found a good use for yuzu & cut both my trees down. I am very interested in this as I have considered doing this cross myself. Quite a few excellent products are made from Yuzu. My fave is Yuzu Kosho, a substitute for wasabi popular in Western Japan. I never found a good use for yuzu & cut both my trees down. And you never bothered to do any research to see how Yuzu fruit are used? PDXIan, how do the first two leaves of this seedling look? Are they round and paired like in most citrus seedlings? Or smaller and unpaired? - that would indicate fingerlime parentage. They look smaller, and not paired. That's what I thought, also the inner(I don't know the name of it. Yuzu have two leaves in one, the small inner and large outer)is way smaller/thinner than a Yuzu. Yuzu may be able to survive in Portland, Oregon, if it is planted outside as a mature tree in April. Sure I did, and still couldn't find a use for them. I'm not going to float them in the bath & as far as a good tasting citrus, it isn't. This is a Faustrime x Ichang Papeda cross. Faustrime is the seed mother. It was in bad condition and died shortly after. Mikkel, the medium your Faustrime x Ichang Papeda cross is planted in looks quite strange. What is the mixture made of, also what is all that white stuff on top? It looks like it would not drain very well. it is a layer of pure sand on top to prevent mourning mosquitoes. I had strong issues last winter. I guess that's probably better translated as 'fungus gnats'! I used google translator to find the english term. Scientifically it is called Sciara spec. and Trauermücke in german. Yes, then in English it is fungus gnats. On the picture, it seems that your main issue is not fungus gnats but red mites. I was thinking about using this picture... yes they had red mites too. This picture is after the treatment. New sprout on top was free of diseases. 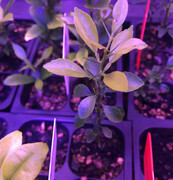 Re: Yuzu Fingerlime cross, the lower leaves of your seedling do look a lot like a microcitrus X citrus hybrid. Some hybrids of citrus X microcitrus have quite large leaves. Look at these pics of citrus X microcitrus hybrids, you will see very similar foliage.